What's the best way to turn an antenna? by far the best way is to rotate the entire tower. with just one rotating mechanism. for easy access and servicing. 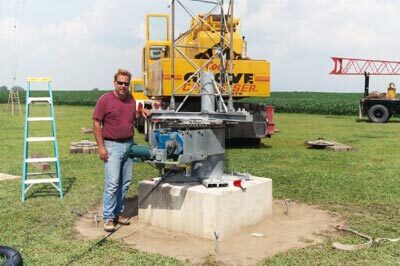 With that philosophy, just a month ago, Jerry erected one of several rotating towers existing in the Midwest. 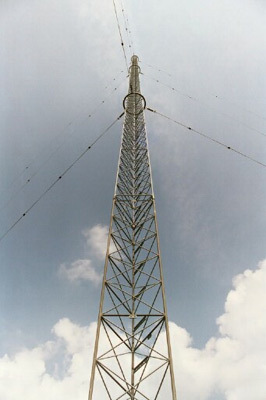 At 195 feet high, it joins nearly a dozen other towers on the WB9Z antenna farm, three miles South of Crescent City, and takes its place as the second highest tower at Jerry's award winning station. Designed by Richard Hassell-Bennett, KØXG of Bettendorf, Iowa, the system is the first in the country to use a heavy-duty commercial PiRod tower. KØXG said that with the 30-inch face and solid 1-1/4” legs of the PiRod, this monster tower can support all the antennas of Jerry’s dreams. The specifications for the tower include a total of 30 cubic yards of concrete in the foundation and anchors, and three levels of 3/8” guy wires with rotating bearing races at 60’, 120’ and 180 feet. The rotator uses a 1 horsepower motor driving a gear reduction system, followed by a 1.5 inch wide industrial chain drive to turn the turntable upon which the tower sits. The drive reduction from the motor to the tower has a ratio of 6000 to 1, and takes about one minute to turn the tower 360 degrees. The base has three bearing races with over 300 ball bearings of 3/8” diameter and sits on a huge concrete base. With no wind, the base load is approximately 9 tons, increasing greatly with high wind. Why build such a beast, we asked Jerry. His answer, “I just got tired of getting beat up by the East coast stations on 20 meters, which is one of the best bands for DX contesting. Also, with this tower, I can compete with the likes of Mike, W9RE, in Indianapolis, and N9RV, Pat in Albany, Indiana, where each have stacks of 20 meter beams.” Jerry’s antenna plans are to build three custom 20 meter 6 element mono-banders on 58 foot booms and stack them on the tower just above the rotating rings at 60, 120 and 180 feet. On 20 meters, with all three yagis driven, this array will have a gain of 15.6 dB, and with maximum power, it will generate an effective radiated power of just under 55,000 watts! Talk about a “band-opener”! Other antennas planned for the tower will be a pair of long, 9 element yagis with 50-foot booms on 6 meters stacked between 150 and 170 feet. These will be used for long haul ground wave when the band is virtually dead. There will be a stack of four 19-element 2 meter horizontal beams, a quad array for 432, a possible antenna system for 903 and atop the tower, expect to see a huge ten foot dish for 1296 MHz. All the VHF and UHF antennas will be fed with 1-5/8” Andrew Heliax. In recent contests, WB9Z has placed in the top ten stations in the U.S. on VHF/UHF. With this system, he expects to move consistently into the top five. where for decades the station has achieved a worldwide reputation. will perform similarly for Jerry on 20 meters and VHF/UHF. You say you’d like to build one, too. But how much will it cost? According to Jerry, if you need to ask…..you probably can’t afford it!